In very simple terms, symbols are energy. Once you take an attunement and the necessary teaching, you are able to call on these very special energies in either meditation or healing through your intention. In this way, symbols can be thought of as being like divine healing tools which help us in our healing and meditation. They are used in a wide variety of energy based healing practices and they help to ensure that our healing or meditation draws on a much higher vibration of energetic healing frequencies, making it far more efficient. Another way of thinking about symbols is to think of them as keys which open very special doors. Through these doors flow beautiful and loving energetic vibrations that enter our consciousness and help us to correct any imbalances that we may have, thus bringing us closer towards health and happiness. 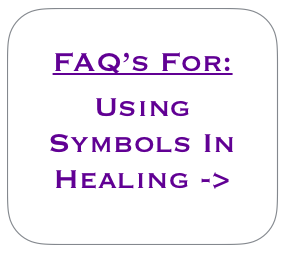 - Why do you use symbols in healing? - Are all symbols the same? - How many symbols are there? - Can I start working with symbols in meditation? - Can different symbols be used to treat different ailments? - How should I use symbols when giving healing sessions? - How accurate do I need to be when using symbols? - I am already using the Usui Reiki symbols, are there more? - Are symbols supposed to be kept secret? - Are all symbols complementary to each other?